Our new Vista Stair & Entrance Solar Light is motion activated and broadcasts up to 16' of super-bright light from an incredibly small light. free-light does it again! Vista is a great solar light for entrance and stairway illumination. It's easily installed with 1 screw in less than 1 minute. Automatically turns on at night at 20% brightness until someone walks by when it goes to full power for 20 seconds. 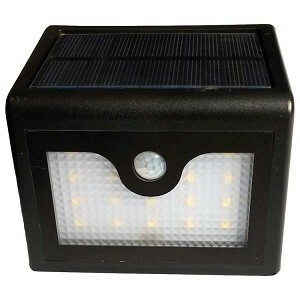 The solar light will stay on up to 10 hours. SOLAR. no wires... ...just add SUN. Now isn't that just like us! Vista Uses: Great solar light for use on garage man doors, docks, deck stairs, back doors, cottage entrances, BBQ light, tool shed doors. Now that we've told you about our new exceptional product, check out all the Vista details and the price. You'd better sit down.